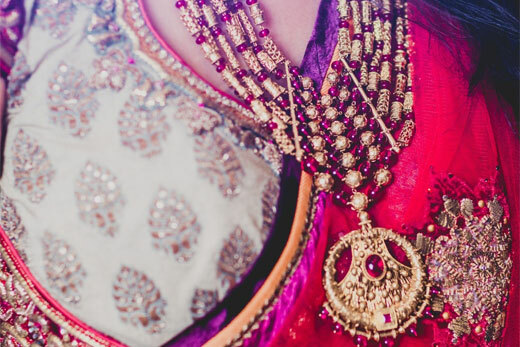 Decadent reds, oranges and beige of traditional bridal hues get a contemporary style update with the Azva seven rows haar of textured barrel beads and a statement filigree pedant. 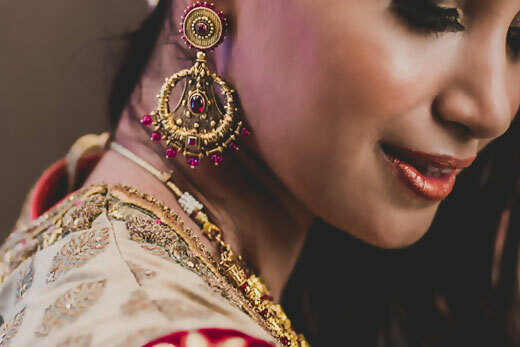 Wedding sutra bride, Priyam, in yet another splendorous avatar is adorned with a ring of a bold kundan set stone at the centre and surrounding scalloped petals to finish the striking bridal makeover. A bangle on her wrist inspired by stylised floral elements, handcrafted with granules in gold adds a playful twist. Luscious layers frame her face with long earrings of fine filigree, topped with beads of bold pink around the edges. 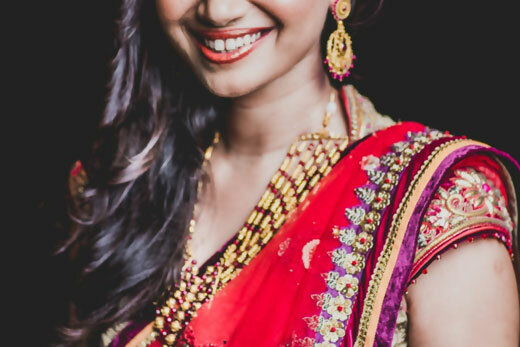 The look here is all about luxury with shimmer playing up her coral lips and a smoky brown eye on a sun kissed skin that amplifies the jewellery galore.